Tying to invest in shares can be a frustrating business. Take the case of Ascent Resources, an AIM tiddler that has been promising good things out of Eastern Europe for a long time - long enough for everyone to get bored and give up hope of anything actually happening. 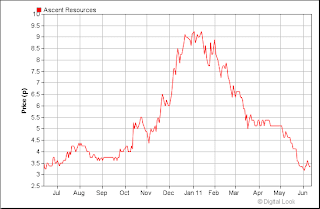 A number of exploration projects did not work out last year and the company's shareprice hit a low of 3p last summer. Then they raised some money via a placing later in the year and again this year to help with a new set of drilling in Petisovski, Slovenia. 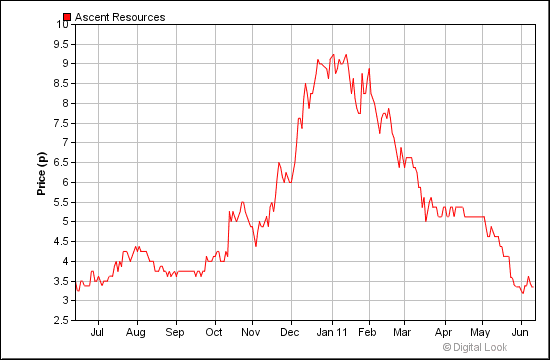 Hey presto, they seem to have finally found a large resource of onshore gas to exploit, as announced yesterday. Now, no word yet on whether it is definitively commercial, but with a large amount of gas in place and the current wells being tested in several zones, some of which are producing gas already and others that will need fraccing, the company is in much better place than it has been for years. The placing at 5p recently shows the faith (or gullibility) of institutional investors in the Company. So this news of success, was met with a big jump in the share price yesterday - but being AIM in 2011 - a nice big fall today too. I guess the RNS on actual commercial rates is awaited and that may be another few weeks in coming. it's just as ugly in silver ! Ijust wish I'd stuck with monthly contributions to the Odey and Ruffer funds I started with 2 years ago. It's not that I can't make some good calls along the way, I can't seem to hand onto the winners and let the dosh roll in. If I had any spare cash (and I don't these days) it's go back to the pros I think. I've decided I'm a better fund picker than stock picker / trader. I think the Tory-led Coalition has decided against more QE and in favour of retaining the low BoE rate for as long as possible. That tends to indicate big company dividends will do better in general than small co (AIM) capital gains. I still find gold a very peculiar bet. Its intrinsic worth (for jewelry, industrial uses) is very much lower than the current price, so there is huge speculation already built in. More than many AIM shares. Isn't that like saying designer jeans are over-valued compared to ASDA jeans? I can't see much sign of a correction there. Gold is useful to us humans - but more useful than chromium, or copper? I don't think so. The civilisation we have exists because of our technology. We could probably keep our standard of living without gold but no copper, chromium or iron would see us back in the stone age. Once you take away the demand for useful gold, everything left is hoarders' gold, and therefore speculative. People buy gold jewellery to look cool and gain status - like they do designer clothes. Except in India they prefer gold jewellery to designer jeans. Gold is becoming the world anti-inflation reserve currency. I thin kti will have a difficult period if there is no moer QE and deflation sets in - gold collapsed as much, or even more, than most things in autumn 2008 - which proves the high element of speculative capital there.